Google voice search is changing the way users search for the information they need. Nearly two-thirds of all smartphone users have used voice search to find local business information in the last year. The impact of voice search is changing the way Google handles search queries—and businesses need to ensure their websites are optimized to keep up. The key to voice search is speed. Google knows that when someone asks for information out loud, they don’t want to wait around for the answer. Websites that load more quickly rise up Google’s SEO rankings. And the informality of voice search puts greater value on a conversational tone of writing. Consumers are asking questions in natural language, and they want brief, down-to-Earth responses such as those typically found on an FAQ page. Voice search is still new, but it’s likely to account for half of all online searches by 2020. Optimizing for search requires a business to be constantly ahead of the game. Check out the infographic below from Headway Capital to learn more. Guest post by H. John Oechsle, President & CEO, Swiftpage. He has a 30-year track record of building highly profitable and sustainable revenue growth for emerging companies and established global leaders. 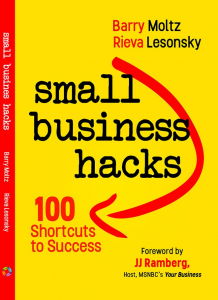 The New Year to-do list for an SMB owner can be daunting. No doubt you’re thinking about myriad administrative and organizational needs relating to accounting and finance, staffing, your product and service roadmap for the year and more. In the course of all this productive planning, and as you look to build stronger relationships that drive ROI in 2019, consider how you’re responding to customer information. Your patrons have shared their data all last year through clicks, subscriptions, customer service requests, sales inquiries and more—and now expect your business to be able to turn those interactions and touch points into a more targeted, holistic experience. SMBs that cater to the right customers—and to enhancing the customer experience—can expect to see big gains. With CRM revenues at $39.5 billion and growing, leaders are investing in this software to improve customer interactions that lead to sales. From improved customer experiences to increased productivity, CRMs are on the rise for a reason and have become powerful and customizable enough to adapt to the needs of SMBs across industries. With that said, let’s take a closer look at what small businesses need to know when looking for a CRM—or evaluating their existing solution—in 2019. Popular for a reason: The CRM landscape is evolving, with SMB-focused solutions increasingly providing greater value to small businesses than enterprise level competitors are able to offer; the social CRM sphere alone is estimated to reach $10 billion in 2019. With real-time insights into customer information, the ever-evolving CRM model will drive relevant content to better fulfill customer expectations. Easy does it: The right CRM can work magic, serving as a single platform that can span across the entire breadth of an organization—sharing information and providing value for customer service, sales, product development, management, operations and more. The sales-cycle will no longer be filled with fragmented or piecemeal information conducted offline on notepads and whiteboards. Playing nice with predictive analytics: Businesses need to craft effective ads, select which customers to cross-sell to and address their customer churn. Since you have access to intelligent information, the question becomes—how will you aggregate and leverage all this data? Today’s best SMB-focused CRMs capture metrics more effectively than ever before. You’ll receive digestible and actionable information in one space. Getting real with artificial intelligence: CRM and AI are quite a dynamic duo. When combined, they can bolster the revenue of your business with a predicted $394 US billion dollars gained by 2021, according to Statista. When paired with a good SMB CRM, AI technology can act as a virtual detective that collects clues to build customer personas, improve your ability to personalize interactions and put the right information in front of your team (and your customers) to help create meaningful interactions. Machines that dance to your algorithms: Once an external function of CRM, machine learning is now integrated into advanced CRM solutions for SMBs. And as the demand for customer intelligence increases, you can take the next best step to make a sale based on your history in the sales cycle. These systems recommend communications based on your customer preferences. The best SMB CRMs are designed to make sales and marketing recommendations that help you close deals faster and cater to your customers’ specific needs. Mapping your customer’s path: If you want to improve the customer experience, listen to your patrons. Trust that your target market is willing to pay more for a quality 1:1 experience. Old data models relied on placing people into broad groups, casting customers as two-dimensional characters based on gender or profession. The best SMB CRMs go well beyond raw data to construct a realistic snapshot of each customer based on new intel they themselves provide: clicks, online accounts and conversations. From awareness to post-purchase, analyzing the ups and downs of your strategy will show when to apply the gas (or brakes) with a customer and focus on retention. Grow through retention: As a small business, you want to move seamlessly from conversion to retention. Make sure your CRM taps into behavioral insights and personally re-engages lost customers. CRM automation can free up your time, allowing you to focus on building core customer relationships without having to manually track down interactions. Tech-driven CRM systems will communicate across channels to rapidly seek information in order to understand each unique situation. Automate your marketing process: Natively integrated marketing automation technology in an SMB CRM solution can help a business improve sales in a hurry. Once you’re able to see which pieces of marketing content lead to customer engagement, how the customer engages, how long and what their next steps are—you’ll wonder how you managed before automating. Marketing automation technology designed specifically for SMBs has gone a long way toward leveling the playing field between small and enterprise level competitors across a variety of industries and market verticals. Nurture the conversion: Nurtured leads convert faster, and more reliably, than when a business relies on the customer to do all the work. Understanding when and how to act on a lead is critical. Since good rapport is all about good timing, the right CRM will work in tandem with your sales team to proactively guide customers toward the products and services best suited to their needs. Mobile is flexible: Increasingly affordable, elastic and with you everywhere you go—the sky’s the limit when your CRM lives on your mobile device. In fact, 68% of CRM solutions will be cloud-based in 2019 and the best cloud-based SMB CRM solutions will have a dedicated (and strategically designed) mobile component. Plan to adopt a CRM system you can rely on while in the field visiting customers with an app that gives you access to specific information instantly at your fingertips. Go for layers with a subscription model: For SMBs, it’s often preferable to pay a small flat monthly fee instead of a more substantial upfront cost. The subscription billing model allows small businesses to effectively control, plan and manage their budgets—while also ensuring their technology is updated and they have access to customer support as the company grows and needs change. In 2019, an effective CRM can provide your SMB with an opportunity to proactively anticipate customer needs and guide the customer experience while streamlining and unifying disparate areas of the business. A CRM won’t solve all your problems, but the right CRM can lead to marked improvements throughout the business while positively contributing to bottom line growth in a variety of ways. Get out there and find the right solution for your business’s growth in 2019! According to the Bureau of Labor Statistics, there are more job openings than unemployed workers in many regions across the U.S., forcing businesses to rethink how they find new employees. This means hiring will become even harder for small businesses, many of whom are already strapped for time and resources. In fact, nearly 40% of U.S. small businesses today report that filling jobs is more difficult than they expected. 1—Make your job description crystal clear. Start with a straightforward, well-defined job description, so potential candidates have a clear idea of the job’s requirements and can understand if it matches their skills and interests. Make sure to include the key details including salary, benefits, work hours and more to inform as many qualified applicants from the start. Pro Tip: Don’t get too creative in your word choice—job seekers are much less likely to discover openings with eccentric keywords. Pro Tip: Using additional questions in the application will help you save time later on in the hiring process by narrowing in on candidates that match your needs. 3—Reply promptly and professionally. In a tight job market where openings outnumber candidates, it is even more important to respond quickly to applicants. To save time, keep your replies short and to the point. Develop canned responses that you can easily customize to ensure responses are polished yet personal. Pro Tip: If you need support, try enlisting your coworkers so they can help with job postings and communicating with candidates. 4—Try using video for screening. After people apply, try asking them to record a short video on their computer or phone introducing themselves and explaining why they’d be a good fit for the role. Video is a quick way to get a sense of a candidate’s personality, especially if you are hiring for customer-facing positions. Pro Tip: Ask candidates to send the video over a messaging app such as Facebook Messenger so that you can easily create a rapport about the video and ask follow-up questions. 5—Respond to every applicant. One of the top frustrations from job seekers is not hearing back from a business after they apply. Whether or not you are interested in their applications, remember to reply (with a thank you) and let them know you’ve received their response. Pro Tip: There’s a possibility that your applicant might be a customer, or refer a future customer, so you want to make sure they have nothing but a positive experience with your company. Hiring doesn’t have to be difficult. By implementing these best practices, small businesses and entrepreneurs can find the right candidates without having to sacrifice on time or resources. According to the new “State of Female Entrepreneurship” report from Visa, 79% of American women entrepreneurs feel more empowered now than they did five years ago. However, they still face a number of obstacles to growing their businesses. To help, Visa just hosted its first She’s Next, Empowered by Visa event in Atlanta, one of the fastest-growing cities in the U.S. for women-owned small businesses. “Women-owned small businesses are essential to our economy and Visa wants to provide these incredible women with tools and resources that can help them grow and advance their businesses,” says Suzan Kereere, global head of merchant sales and acquiring, Visa. Entrepreneurial motivations.The top three motivators for starting a business are pursuing their passions (48%), having financial independence (43%) and flexibility (41%). Funding does not come easily.73% of women entrepreneurs had difficulty in obtaining the funding they needed to start their own businesses, with 61% self-funding. Open to new technology.32% of women would direct additional funding towards newer technology, such as digital or social media tools. Biggest challenges.Women say their top concerns include assembling a good team (37%), finding the right business management tools (36%), keeping up with industry challenges (24%) and building a support network (23%). Battle of the sexes.Most women feel that business challenges are equally difficult for both women and men. However, some believe that negotiating contracts and raising funding come more easily for men than women, particularly when it comes to raising funding (34%), negotiating contracts (35%) and making tech decisions (20%). In Atlanta more than 150 female entrepreneurs heard from industry leaders, including, Facebook, Square, Yelp, Instagram Story School and Authorize.Net. The keynote was delivered by fashion icon Rebecca Minkoff. There was also contactless-enabled vending machines creating a unique shopping experience featuring select items from Atlanta-based, women-owned small businesses—100% of the purchase price of products sold from benefited Women’s World Banking, a non-profit providing low-income women entrepreneurs around the world the financial tools and resources they need to thrive and pursue their dreams. Attendees received a resource-filled She’s Next toolkit full of information about how to run and improve your business from industry leaders, key resources and a description of Visa’s full suite of payment services designed for virtually every business need. The toolkit will soon be available to download online for small businesses nationwide. For more information on the She’s Next, Empowered by Visa initiative, visit www.visa.com/shesnext. In a recent survey Paychex, Inc., a leading provider of integrated human capital management solutions for payroll, benefits, human resources, and insurance services, asked full-time employees working in companies with 1,000 workers or fewer about workplace hot topics, including benefits, pay equity, HR technology, corporate social responsibility, and if these HR trends are impacting them. Benefits: Employees are split on the most complicated aspect of making annual benefit elections: 29% say it’s keeping up with plan changes; 28% say it’s trying to predict personal and family needs; and 28% say it’s evaluating all of the providers and plan options. For women, trying to predict personal and family needs when making benefits selections is the number one most complicated aspect of the process at 33%. That ranks third for men at 24%. Retirement: 51% of employees feel very confident in their retirement savings, but for 25% that confidence is dependent on Social Security remaining intact. This confidence increases as employees get older: 48% of w: orkers age 18-34 are confident in their retirement savings, 51% ages 35-49, and 58% of those 50-65. Pay equity: 48% of employees—regardless of gender—have expressed verbal or written concern to their current employer that their current pay rate was not equitable to another employee with a similar role and responsibilities at least once during their career. 77% of men are confident their employer is auditing employee pay for gender equity, while 74% of women say the same. HR technology: 71% of employees expect their employers to provide them with a high level of employee self-service that allows them to accomplish various HR tasks (update address, enter life event, fill out tax forms, report hours, manage retirement, etc.) on their own. And 85% expect such self-service applications to provide a simple, intuitive user experience, similar to the consumer apps frequently used in their personal lives. Workplace ghosting: When asked if they had ever “ghosted” (leaving a current job or not reporting for a new job without informing the employer) from a current or potential job, 27% of employees admitted they had. Younger workers are much more likely to have ghosted companies. Of those aged 18-34 and 35-49, 33 and 30%, respectively, admitted ghosting, compared to only seven% of employees who are 50-65 years old. Corporate social responsibility (CSR): Working for an organization that is socially responsible is important to workers regardless of age—95% of those aged 18-34, and 94% of those 35-49, agree that it’s important for their employer to be socially responsible. That dips slightly to 90% for those aged 50-65. “CSR is an important driver in attracting and retaining talent for companies today,” says Laurie Zaucha, Paychex vice president of HR and Organizational Development. Click here to read a white paper featuring a deeper dive into data about these key workplace trends. Speed is essential when it comes to websites. Load time statistics from numerous studies clearly show that if the average page load time exceeds 3 seconds, abandonment rates soar. High bounce rates telegraph to search engines that visitors don’t find the website useful, which directly affects your ranking. And if that wasn’t enough, the numbers clearly show that shoppers avoid returning to e-commerce sites with performance issues. The marketing truism that there is no negative publicity doesn’t coincide with the digital reality of social media and interconnectivity. Nearly half of the users share negative experiences with their peers, spreading the word of heavy, unresponsive sites faster than said web pages load. Check out the infographic below from Hosting Tribunal to get up to speed. Infusionsoft has rebranded the company as Keap, a name it says represents the very essence of the grit and passion small businesses put in each day to keep going, keep serving and keep growing. It is also launched a new product, also named Keap, the industry’s first smart client management software built specifically for small businesses in the home, personal and professional service industries. For 17 years Infusionsoft has been a pioneer of CRM and marketing automation software for small businesses. With the Keap product launch, the company is expanding to serve a new market. Targeted at small service providers such as interior design, home repair, fitness or business consulting, Keap is smart client management software that automates repetitive sales and client-related tasks like appointment scheduling, following up on leads/quotes, and collecting payments. It does this by intelligently prompting the user when and how to follow-up with personal and professional communications. Organizes and centralizes all customer information and daily work in one place. Keap organizes customer information and daily work in one place so it’s connected and organized. A mobile app provides easy, 24/7 access to client information from anywhere. Frees small businesses from repetitive tasks to save time. Keap’s online appointment scheduling, simple auto-reminders, and personalized follow-up communications give small businesses back their time. No more playing phone or email tag with clients to set up meetings, follow up on proposals or quotes, and chase down late payments. Helps small businesses provide great service to their clients. Keap’s online tools help small businesses wow clients by making it simple to book appointment times, view or accept personalized quotes, and pay online invoices in seconds with a one-click “pay now” button. Customizable, automated reminders and updates help small businesses and their clients stay informed every step of the way. Private sector employment increased by 213,000 jobs from December to January according to the January ADP National Employment Report®. Broadly distributed to the public each month, free of charge, the ADP National Employment Report is produced by the ADP Research Institute® in collaboration with Moody’s Analytics. **Complete details on franchise employment can be found here. To obtain additional information about the ADP National Employment Report, including additional charts, supporting data and the schedule of future release dates, or to subscribe to the monthly email alerts and RSS feeds, please visit www.adpemploymentreport.com. Want to disappear from the world wide web? WD Storage (Whitefields Document Storage) shows you how in the infographic below. Entrepreneurship for All (EforAll), a leading inclusive entrepreneurship program and its Spanish language program, EparaTodos, are stepping up in a big way to support small businesses affected by the gas explosions on September 13, 2018. EforAll’s program EparaTodos was named the lead organization to conduct outreach to businesses owners who have been impacted by the recent gas explosion in the communities of Lawrence, Andover, and North Andover. EparaTodos has been working with a consortium of partner organizations and cities/towns: City of Lawrence, Town of Andover, Town of North Andover, ACT Lawrence, Commonwealth of Massachusetts, Lawrence Partnership, Mill Cities Community Investments, Massachusetts Small Business Development Center Network, MassDevelopment, Merrimack Valley Small Business Center, Essex County Community Foundation, and Massachusetts Growth Capital Corporation. Bookkeeping help: Businesses with active claims that need assistance compiling the proper paperwork, or those that want to streamline their record-keeping, have access to a professional bookkeeper who will work on site to provide support. Accounting technical assistance: Services include support with business registration and business formation, bookkeeping, payroll, profit and loss statements, and tax planning. Claims assistance: Businesses can connect directly with Columbia Gas claims staff to speed up claims processes and resolve any issues with the claims process. General assistance: EforAll has a group of volunteers with expertise in a wide range of industries that can answer questions from business owners. The volunteers are experienced in human resources, real estate and other fields. ORIS Intelligence, provider of actionable insights that preserve pricing integrity for manufacturers, recently unveiled new insights into pricing violations and unauthorized sellers. Online spending grew by nearly 20% during the 2018 holiday shopping season, reaching over $110 billion in sales. With the continued increase in online shopping comes an increase in pricing violations and violators. New ORIS data shows that for the average brand, 75% of their total sellers are unauthorized, with the housewares industry at the highest rate of unauthorized sellers at 85%. In addition to violators, pricing inconsistency is also an issue as the average violation rate sits at 14%, with the apparel industry showing the biggest discrepancy with 20% of their URLS in violation. Make the most of MAP: More companies are realizing the impact a properly executed MAP policy has on not only brand integrity but revenue. In addition, trusted retailers will start ensuring the brands they work with are committed to their MAP policy, and we expect to see retailers that exclusively work with brands that enforce MAP. Sniff out seller strategies: As more manufactures enforce MAP, sellers will continue to be creative in trying to find ways around MAP by playing games. ORIS data shows that 12% of violations only occur during non-business hours, when retailers think manufacturers are not watching. Push prices: Due to the increase in brands enforcing MAP, we’re seeing brands begin to increase their minimum pricing, to counteract those that violate it. Bevel, a public relations consultancy that connects clients with stakeholder communities, recently announced the first application of performance-based pay to the communications industry. At Bevel, Associates and Directors are driven to achieve results through year-end performance-based bonuses and quarterly payouts based on success metrics including number of speaking opportunities, award submissions, customer events, in-person meetings with reporters and media coverage for clients. “A first-year analyst makes on average $150k and third-year analysts make up to $350k. An assistant account executive (AAE) in PR generally makes 34k a year, the same rate as a cashier at Trader Joe’s and the industry wonders why there’s a massive talent drain. It’s simple. Top talent wants to get paid for their work,” say Jessica Schaefer, CEO of Bevel. The structure of the firm mirrors that of a typical hedge fund or private equity firm leveraging a PM/analyst model. Bevel’s Directors manage their own portfolios of clients and have two associates working underneath them. Each portfolio is diversified and includes a mix of crypto, fintech, consumer tech and venture capital funds. Directors are incentivized by client retention and management of their respective associate teams. “Our success as a firm is driven by how much we can move the needle for our clients. We want to work with and build category leading brands. In order to do that, we need to attract top talent and maintain peak performance,” Schaefer adds. The New York-based firm recently opened an office in Los Angeles and was named 2018 “Small Agency of the Year.” For more information, please go here. The better your negotiation skills, more likely you are to succeed. Take a look at this guide from Hiscox insurance to sharpen your skills. Want to know more about advertising on Facebook? Check out this guide from AppInstitute. Best Egg, the consumer lending platform supported by Marlette Funding, LLC, is partnering with SuperMoney to help consumers achieve their financial goals. SuperMoney integrates with leading financial service companies to offer a seamless and transparent comparison-shopping experience. Borrowers complete a short online form and receive real-time personalized loan offers from SuperMoney’s lending partners. The partnership with SuperMoney is another step in Best Egg’s ongoing journey to make online personal loans frictionless for customers. Find Best Egg here. QuickBooks just launched a sales tax calculator landing page on their site. With nearly 11,000 local sales tax jurisdictions in the U.S., the goal is to help SMBS see how the different sales tax affects their businesses. It also can help avoid the hassle of figuring out sales tax and all of the rules that exist in each state, including the multiple factors that could change a sales tax calculation. Zenefits just announced the availability of Compensation Management, a new app within the Zenefits People Platform. Based on actual salary data from small businesses nationwide, Compensation Management is the first software tool designed specifically to take the guesswork out of competitively and fairly paying the people working in SMBs. While compensation benchmarks and software tools exist on the market, both are priced and scoped out of range for small businesses, which are left to make their best guesses. With the average cost to replace an employee at 33% of their salary, according to the Work Institute, making poor salary decisions can have a significant impact—especially on small businesses. Compensation Management can help small businesses identify market competitive and fair wages by role, industry, and geography. The app poses questions during set up to help business users determine the compensation philosophy that best maps to each company’s unique priorities and values. Then it provides insights on salaries for new hires, new promotions and new roles as the company grows. It helps young businesses keep a pulse on pay equity across its organization, aligning pay to role and performance, which call all be tracked in the Zenefits platform. Confidently set salaries when filling open roles: Run salary benchmarking reports that customize data for industry, geography, job, and seniority level to ensure a company is using the most accurate, relevant data to set salary levels for new hires. Create benchmarks based on actual employee salaries: Get relevant data by specifying the industry and geographies relevant for each company and map the business’s workforce to a standardized list of roles and experience levels for an exact salary comparison with similar positions at other companies in the same region(s). Quickly and easily assess the health of a company’s current compensation practices: Look across the organization to determine where the company is overpaying and underpaying; then, narrow the search by location, department, role and gender for additional insights and recommendations on potential compensation corrections. TriNet, a leading provider of full-service HR solutions for SMBs recently announced the release of its latest version of the TriNet Mobile app, which further enables SMBs and their employees to access their HR data—anytime, anywhere. The updated TriNet Mobile app helps SMBs streamline HR processes, improve employee engagement and offer real-time access to HR information. It also includes easy access to HR functions, such as submitting time-off requests, retrieving information on health benefits and accessing a detailed view of payroll data. Additionally, employees can access a company directory and communicate directly with their teams through the app. Detailed pay history, with in-depth paycheck comparisons. Detailed company directory with colleague contact details. In-app messaging for team members to communicate. Summary and approval status for recent expense reports. TriNet Mobile is available for download on iOS and Android. You can’t get the most out of social media unless you monitor and analyze your results. How do you do that? Check out this guide to some top social media analytics tools from FitSmallBusiness. The shipping of specialty goods, such as fine art, furniture, oversized or fragile objects has not yet been streamlined. With the recent report that U.S. online sales of non-conveyable goods has hit $30 billion, equal to about 10% of total e-commerce sales, ARTA, the contemporary logistics platform for shipping specialized items, is introducing a new approach to logistics. In 2018, ARTA upgraded its solution, adding 10 new features including ARTA Instant Quote, which enables buyers and sellers (businesses or consumers) to immediately receive bookable quotes through the ARTA Shipping Calculator. The platform already allows users to easily shop for additional quotes from ARTA’s vast network of more than 350 service partners. Increased demand for buying specialized goods online: Buyers are becoming more comfortable with purchasing high-value, fragile, or oversized goods online—goods that cannot be shipped and handled by conventional parcel networks. And given the global nature of ecommerce, online sales of items from furniture, art and design objects to medical and workout equipment will present a tremendous opportunity for businesses and individuals invested in this category. Focus on digital fitness: Businesses that understand how to leverage new technologies, from data analytics to automation and platform solutions, will come out ahead in 2019. Along with an increased demand for buying specialized goods online, consumers will expect that fulfillment of these items should be as seamless as purchasing something on Amazon. Thus, companies will have to invest in supply chain solutions that can support these trends in order to compete and gain market share. Perfecting payments: Just like with the traditional e-commerce market, the payment process will become more automated for specialty items as shippers and logistics providers cater to providing a more ubiquitous experience. Compliant solutions that support various payment methods for high value transactions and multiple currencies will be essential to support the market demand.